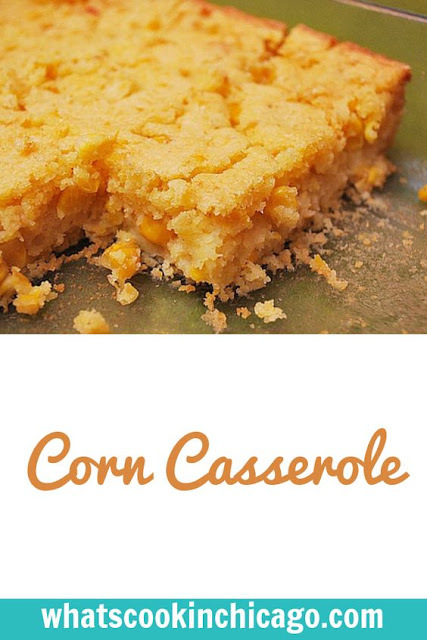 Many may already be familiar with this corn casserole. If you're like me, it's probably the only time you'd consider buying a box of Jiffy corn muffin mix. But since I already had the ingredients on hand I made a homemade version of Jiffy's baking mix. The rest of the ingredients for the casserole were thrown in. Sometimes cheese can overshadow flavors and textures so I omitted the addition of cheddar cheese since I wanted the corn to really shine through. This was especially good with chili. 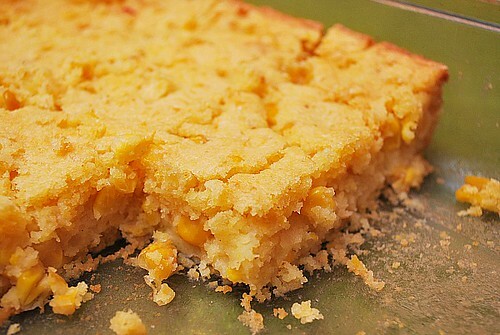 The subtle sweetness of the corn casserole played well against the savory chili. I prepared this in a baking dish but you can also bake this in muffin cups for individual portions... even freezing them to enjoy later too. This recipe also lends itself well to use as a base by adding additional ingredients like cheese, herbs, bacon, etc. In a large bowl, stir together all the ingredients until well combined for the batter. Pour into a greased 9 by 13-inch baking dish or casserole dish. Bake for 45 minutes, or until golden brown. Let stand for at least 5 minutes and then serve warm. I love this Paula Deen recipe! Thanks for the reminder. OH MY GOD...made this last night with a roasted chicken and stuffing...it was sublime! We love us some Paula Deen and BUTTER!!! I feel I need to correct you on this. "Why is it that we only enjoy certain dishes during Thanksgiving and not throughout the year?" Wouldn't anybody enjoy eating this at any time during the year? Apart from during the warmer months, I think yes. Hi Amateur Cook! Thank you for your comment - I appreciate it. I've chosen not to change my original wording because there are some folks that do in fact prefer to eat or enjoy certain foods seasonally or around various holidays even though foods can be made/cooked/baked any time of year. I also don't want to single out those that cook meals but include those that enjoy them too. This looks great, I love dishes that are made with corn. I'm excited to give this a try! understand who you might be however definitely you're going to a well-known blogger in the event you are not already. Cheers!